Most bloggers do not realize that there is a setting in Akismet that automatically deletes comments before you ever seen them. If you have that box checked and someone who has inaccurately been flagged as a spammer by Akismet leaves a comment, their comment will be immediately deleted. Read comments from Alex from Automattic. You will never see it and they will be taken to a blank white page. Read what Alex (from Automattic who appears to the be public spokesperson for Akismet) wrote about commentators seeing a white page after commenting. The full screen capture below shows where the Akismet Configuration can be found in the left sidebar and where the check box is located in the main section of your blog dashboard. See the next image for a closeup of that checkbox. 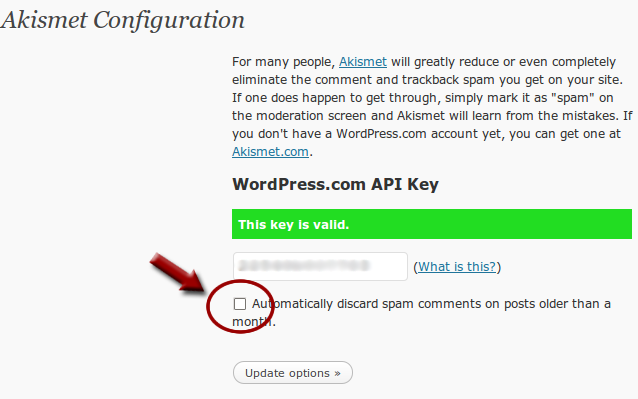 If you do NOT want Akismet to delete comments before you see them UNCHECK THE BOX shown in the close-up below! How many of you would have any idea that checking that box would immediately delete valid comments you have never seen? That IS what it will do. Here is a screen capture of that page. I will get red arrows added to point to the appropriate settings when I can. Turn on threaded comments at least three and ideally either four or five levels deep. Enable Before a Comment Appears: Comment author must have a previously approved comment. Do require commentators to use a name and email address. Do NOT require commentators to be registered and log in – doing so greatly decreases your comments. Busy people do not have time to log into every site they visit every time. Special thanks to Ron Cripps of AffiliateXFiles for adding the red arrows to the images used in this post. If you want to know the REAL truth about Affiliate Marketing read his blog. Ron is one of the three Ethical Affiliate Marketing Experts I recommend. Akismet is useless for blogs like this one. It does not block spambots and they were leaving 1000 comments A DAY here. That is why the GrowMap anti-spambot plugin is essential for this site and others like it. Gail Gardner would love you to read ..Guest Blogging is Dead; Long Live Guest Blogging; NOT Done! Brilliant. Was not getting two hours worth of spam but enough to make me want to go crazy. Thanks for this. Keen to see how it works out. GASP works really well as you can tell by searching for reviews online or checking out the tab on this blog. Are you connected to prepaid365? I am seeking a solution that would allow us to open PayPal accounts for specific blogs and send debit cards to partners in other countries. If you can answer any of my questions about prepaid365 please let me know? Thanks. I do indeed work with Prepaid365 but we are a reseller of prepaid cards. You ought to look at solutions like Neteller – which allow issuance in multiple countries – in fact they have cards in 8 currencies – http://www.prepaid365.com/neteller-prepaid-card.html. The other one to consider for payouts and agents is Payoneer – http://www.payoneer.com/. Yes, that may help. I need to find a way to open PayPal accounts for specific Joint Ventures and am hoping a prepaid card could be the way to do that. If anyone else has ideas on the best way to do that please chime in. I am just so glad I found GASP. I just hated akismet. I know the creator were trying to do something good, but it was just awful. After I got CL premium and GASP in it, things have become so much easier and faster. So, thank you for GASP. You and me both! We have Phil Hollows at FeedBlitz and Andy Bailey at CommentLuv to thank for GASP. It saves me at least two hours a day moderating comments. I think Akismet is only for blogging plate form not for website but I am running website. I think this plug-in is for blogging environment. I’ve turned Akismet off. Trying to see how it goes with just GASP turned on. So far so good. Akismet is overhyped. Akismet benefits from being part of what I call “The Borg” – the tools favored by the wealthy elite promoted by what they control online – like Google, Yahoo, AOL, Facebook, Twitter, Google+, etc. Most people ASSUME that whatever they hear about most is best when the truth is whatever they hear about most gets free publicity from the major sites and major media. It happened a lot of time with me that I commented but the page appeared blank. I never know why it is happening but today secret has opened to me. I have not used Akismet before. But, having comments deleted after a month is dissapointing for any audience. Hey Gail, thanks for the informative post on the quirkiness of Akismet. I’ve always wondered about the dreaded “white page”. Now that I know, I’ve simply removed Akismet altogether and guess what. The tons of spam have stopped heading my way. Adding your GASP, has been a breath of fresh air. If I use the wrong domain on a blog that’s using akismet, the commend gets deleted immediately, not after a month. If you are flagged as a spammer and the blogger has the option explained in this post checked your comments are immediately deleted IF the post where you leave them was published more than 30 days prior to you leaving your comment. That check box does NOT mean your comment gets deleted after 30 days (although that IS how many of us read it) – it means that your comments will be immediately deleted if the post is 30 days old or older and go to spam if the post is less than 30 days old. I see now. Thanks for explaining it. Basically if a post is more than 30 days old we shouldn’t even bother commenting when using a domain that has been flagged. Btw, I read of some blackhatter commenting to his own blogs using his competitor’s domains and then hitting the spam button on the comments. They are using this same technique in other ways (duplicate content can also be a weapon to shoot down competition) but I don’t want to divulge all these bad things, true thing though… anything that’s used to fight something can be used against us by the same forces that we are trying to fight. Yes, that would be true. Some have been successful at getting unflagged for a while but the way Akismet chooses to set up their algorithm it will only be a matter of time before you get flagged again. There is no limit to what selfish people will do so I am not surprised that they would use such an easy way to hurt others. There is no doubt in my mind that Akismet is intentionally set up to hinder the usefulness of backlinks created by commenting. That is why we removed it. We are testing an awesome custom anti-spam solution. Please leave a comment there (dofollow, commentluv & keywordluv enabled so well worth it!) so we can roll it out as soon as possible to as many other blogs. I was getting 80-100 spam comments daily in one of my blogs. I then installed Akismet like plugin ‘Defensio’ . It is working fine with me. One of the major issues with Akismet is there is no consensus among bloggers on what is spam and what isn’t. I’m using Akismet since a few months, i didn’t know we can do that, but i think they should change the blank page because people can think that it is a technical problem from the blog and not a “spam detection”. From the comments their rep left in this blog it appears that the blank page is their intention and they’re not concerned with what real people who see it think. I wonder when they are going to get rid of that white page. It would be so much better if they displayed some notice alerting the commenter that his/her comment was tagged as spam and that they should contact the blog admin to rescue their comments. .-= Udegbunam Chukwudi@Blog Setup Service´s featured blog ..How To Organize Your WordPress Posts In Categories =-. Alex from Automattic clearly indicated that the white page is intentional so they are probably not going to get rid of it. It is intended to derail bot activity but what it does to real people is inappropriate. .-= Gail @ Support Small Businesses´s featured blog ..How CommentLuv Grows Businesses and Blogs =-. They should really make that option more clear as it does sound like a beneficial setting if you don’t know exactly what it is doing. And especially thanks for the post because I didn’t think I had that box checked yet when I just looked now it was! .-= Chris@Sports Cars for Sale´s featured blog ..2007 Porsche 911 GT3 RS for Sale =-. Several experience bloggers misread what that option does and I could swear I turned it off in one blog and when I checked it again it was back on! 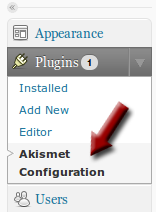 So if you use Akismet, do recheck regularly and especially any time you update that plugin or WordPress. Do check out the post I’ll feature in CommentLuv on Local Search Directory Listings – they would be a perfect way to get more free visibility for your business from major sites like Google, Yahoo, Bing, SuperPages and dozens more. .-= Gail @ NO Akismet´s featured blog ..Local Search Directory Listings =-. I have disabled Akismet is all my blogs and just realized that this setting was checked in other blogs I co-manage when my latest comment was deleted! Even if you are an Admin in a blog Akismet will delete your own comments if you’re not logged in. There is no way I’m going to use Akismet any more but I have to find a way to deal with the spam. .-= Gail´s featured blog ..Proper Ways Your Business Can Use Social Media Channels =-. Glad about that, seems maybe it’s only checked on blogs created before a certain time. .-= rob sellen´s featured blog ..Commented here Thanks- added another benefit =-. I am currently not using Akismet what I am using is the lines below in my ht.access file because most spam comes from nowhere one example today someone arrived directly on my contact page but I do not have one so he got a 404. But why would anyone land directly on a blogs contact page unless they wanted to send spam to the Administrator it would also help reduce email spam if you renamed your contact page to something else like get in touch or something like that readers will still understand but bots will not so easily. .-= Roezer´s featured blog ..When to use your Twitter Profile in Blog Comments =-. Too much SPAM comments lately. I will keep the auto delete on. .-= Jayce´s featured blog ..Top 10 Sprint HTC EVO 4G Tweaks and Hacks =-. If we expect others to publish our comments and links we have to be willing to publish theirs. That is why I believe there will soon be totally separate communities with very little overlap. Those who are generous and selfless will interact with others like themselves and avoid sites that want links TO themselves but not FROM themselves. There will ALWAYS be spam and the more successful you get the worse it gets. ALL sites get spammed – not just dofollow sites. You actually want someone else to automatically delete comments even if they are from your regular readers and commentators? That IS what that function does and I for one will not treat my readers that way. Remember that Akismet could very well flag YOU as a spammer and start deleting your comments too. .-= growmap´s featured blog ..Find Out If Akismet Has YOU Flagged as a Spammer =-. Hi Gail, thanks for sharing these instructions. 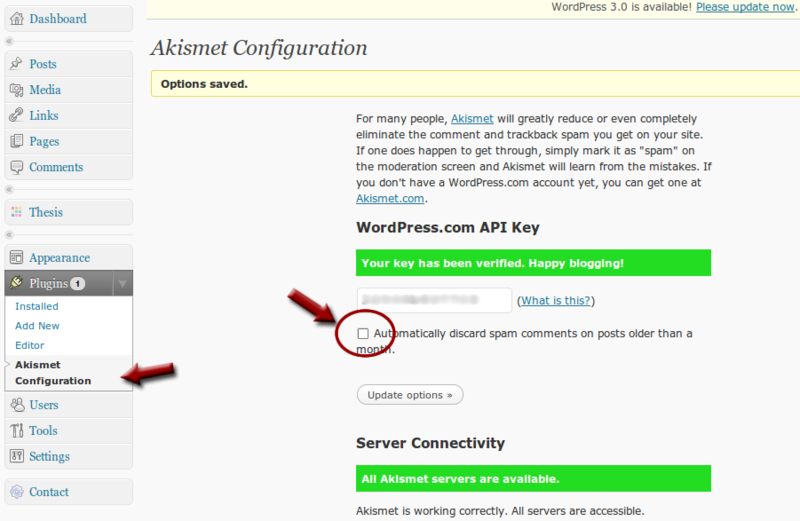 I have a wordpress.com blog so I need to check to see if there are options in the Akismet settings there as well. I’ll stop back and let you know if they are the same or in what way they might be different. .-= Ileane´s featured blog ..Introducing WordPress 30 via WordPresstv =-. I had intended to add the instructions and screen capture for WordPress hosted blogs too. 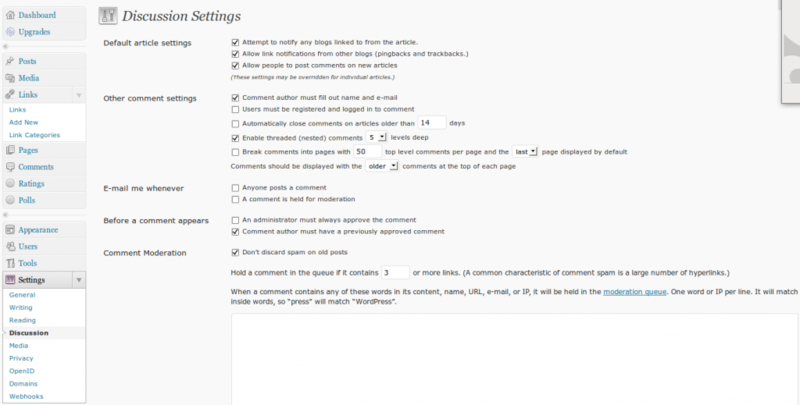 I updated the post to include how to stop those blogs from deleting comments too. As soon as I can get the image edited I will have where to click on that screen capture highlighted too. Gail, you are really helping a lot of us in understanding the whole situation. You are helping us realise that Akismet is not such a thing called ‘set it and forget it’, and there are many problems with it. So thanks a lot for raising your voice regarding Akismet, and thanks for giving us all these tips. Three out of four experienced bloggers misread that setting and did not intend to delete comments they had not reviewed. That is why I wrote this post. Now whenever we are out commenting and see a white screen we can send the blogger this post so they will know why comments are going missing. .-= growmap´s featured blog ..How to Build a Successful Blog Based Business =-.